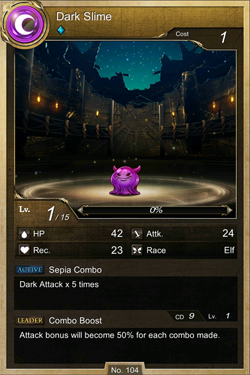 Here's a game guide on how to level up to active skills to reduce the CD of monster cards in the Action RPG puzzle card game - Tower of Saviors, available on Android Google Play and iOS App Store (mobile devices). Leveling up your monster's CD ("cool-down") will decrease the number of turns to activate it's active skill, this is a must if you want to win against bosses late game. - Completing battles will give your team some exp points, too bad we can't see their exp bar though. - Just use your cards in every battle to level up their active skill CD. - At higher levels, it will require more and more battles, to help you increase it faster, refer below for more options. - Both name MUST be exactly the same, even if they have different attributes or Lvl. - For sure, using 2 same cards will increase the other one's skill level since they have the same active skill name. Make sure that your base card is the one you want to level up because the other one will disappear! - Another note, sometimes it is best to keep multiple cards of the same kind, especially cards from the Diamond Seal, choose wisely. 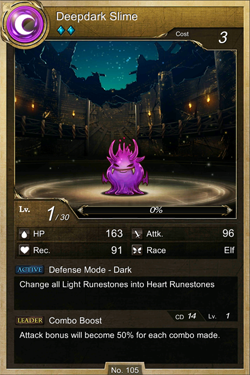 - Deepdark Slime's Skill Lvl is 1, if you will use this card, it will only give you around 20% success chance for 1 Skill Lvl Up. Stacking 5 Deepdark Slimes will not increase the chance, each will get around 20% success chance each. - This is what I highly recommend to make things easier, farm lots of Dark Slimes then evolve them to Deepdark Slimes. You can't use Dark Slimes to your GSoD because they have different active skill names. 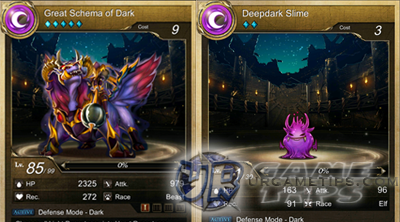 - Next, choose 1 Deepdark Slime as your base card, level up it's Active Skill by using other Deepdark Slimes into it until your reach Lvl 10. I think for Slimes, it's easier to reach Lvl 10 than other cards. - You can also use them into battles to slightly increase their Skill Lvl before feeding them to your base. - Next, if you reached that Lvl 10 Active Skill, it's time to feed it to your GSoD card for 100% success chance!, that's not all, your GSoD card will also get a maxed Lvl 10 Active Skill! What is the Max Level for Active Skills? - Level 10, the CD varies per card. Will the Active Skill Reset If I Evolve My Card? - Nope, it will carry on it's previous skill Lvl and CD. Where Did you Farm those Slimes? - 1* Summoner's Test - Enochian Tower or any 1st Seal battles - island regions. - 2* You can farm them on any 6th Seal battles, but I recommend you evolve their 1*, it's easier. - To find these monster cards go to ToS wiki card gallery, then find you card. Next, click on your card's active skill name to check all monster cards with the same name. - If it is not farmable, you'll need to use them in every battle then use Harpy Cards to max their skill CD. Where Can I Get More Harpy Cards? - Mostly from event battles or login rewards, certain battle rewards, Lost Relic Monday's Daily battle - Collection of Elements ("it's very rare though"), and more.